The FM8 is based on FM synthesis, which made its mass market debut in 1983 with the Yamaha DX7. Native Instruments brought back FM synthesis with the FM7, and it was better than ever. The new incarnation of this successful synthesizer is the FM8. Designed as a convenient plug-in, the FM8 has 32-bit resolution for superb sound quality, an innovative algorithm programming matrix whose flexibility is light years ahead of older FM synthesizers, extensive modulation, a rack of effects, a filter module/Operator, multiple waveforms and an Arpeggiator. 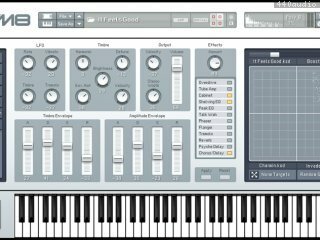 Although FM synths had a reputation of being difficult to program – and they were! - the FM8 offers a unique "easy" page that makes it simple to customize sounds to perfection, without having to learn programming. 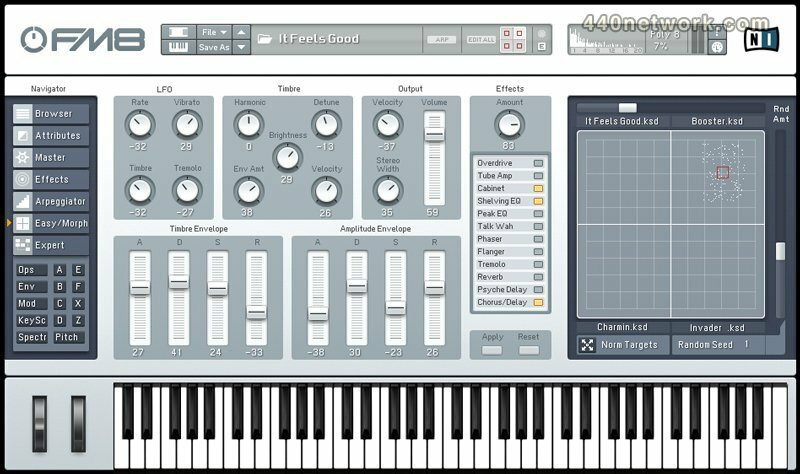 All the great features of FM synthesis are included, such as an "analog" control to add slight amounts of randomness, and a microtuning page for alternate tunings. But it also has modern essentials, such as envelope and delay sync to host tempo, 64-voice polyphony, variable resolution for lo-fi sounds, total MIDI control, and much more to bring FM synthesis into the 21st century. 64bit compatibility fix for Mac OS X 10.7 "Lion"